This week's EtsyInspired shop is Fantasy Art of Maigan Lynn. I'm so thrilled to be showing of the beautiful artwork of one of my close friends this week! Maigan is a sweet person and an amazing artist. I love her whimsical designs! She has mermaids (which are my favorite), fairies, pumpkins, mushrooms, seashells, and snow mermaids. I love the beautiful colors she uses in her artwork! I feel that they are unexpected. And they are even more beautiful in person. The colors are vivid. The coloring has a lot of shadows and depth. I often try to mimic Maigan's amazing shading skills in my own creations. These little gems are available in originals, several different sized prints and even puzzles! How fun is that? They are perfect for anyone in your life who loves fantasy art. To play along with our challenge, all you have to do is go to the Fantasy Art by Maigan Lynn shop and pick any item to be inspired by. Make your creation and post a link to it on the EtsyInspired #79 post on theEtsyInspired blog by next Friday, Mar 12 by noon Pacific time. Everyone will be entered into a random drawing to win. If you upload to SCS or PCP, please use keyword EIC78. And PLEASE remember to give credit to the shop that you found your inspiration from. This week Maigan is offering up a PRIZE too! One random winner will get to choose three (3) 4x6 prints of their choice! Lucky ducky, I wish I could win! We also have an AMAZING sponsor this week! It's GLUE ARTS! They have the most awesome (and affordable) glue runner with a handle. I love it! It's so easy to use and not bulky at all. The cartridges come in all different kinds of adhesive ie permanent, repositionable, squares, etc... They also have fabulous ribbon adhesive. You can stick it on to ribbon and it will make the ribbon lay flat on your card. 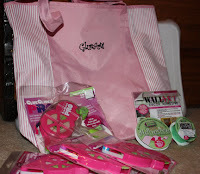 Glue Arts carries a whole line of amazing products! You should check them out. They are offering up a prize pack this week, shown in this picture. How cute is that tote bag? This is my card for this week. I used Maigan's mermaid for QKD called Hearts On My Sleeve. Isn't she pretty? I was experimenting in coloring darker skinned people. How did I do? The background paper is SU. The ribbon is from the Target $1 spot. Here's another card I made with the same stamp. This one uses My Mind's Eye Be*Loved paper. So pretty! Your coloring is just perfect for each card. Love how you did each one with a different skin tone...very cool. I need to learn to do that. Amazing cards! The skin coloring is right on! Beautiful cards Ash! 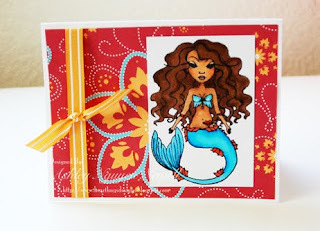 Love this card and your coloring is fabulous. What a great prize this week. We can all use this and that tote is so cool. I can't wait to get start. Wow! I am loving those mermaids!! LURVE your cards..I hope to have some time this weekend to play!! LOVE these cards Ashley & your coloring is GORGEOUS!!!! Fab job!! 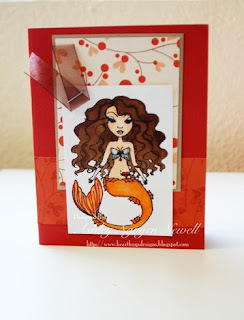 Your mermaid cards are so beautifully colored, Ashley. Fab job, girl! Wow, these are beautiful, love your coloring! These are great!! Fun cards!